I detexted the lettering/logo of the magazine that this picture was from. It's a great piece of art, but the scan's a bit blurred, and the moire is a little distracting. I like the resolution, though, it's very high. Thank you! I was searching this picture. I love their meetings. What a sick scan, brah. Love that pose. 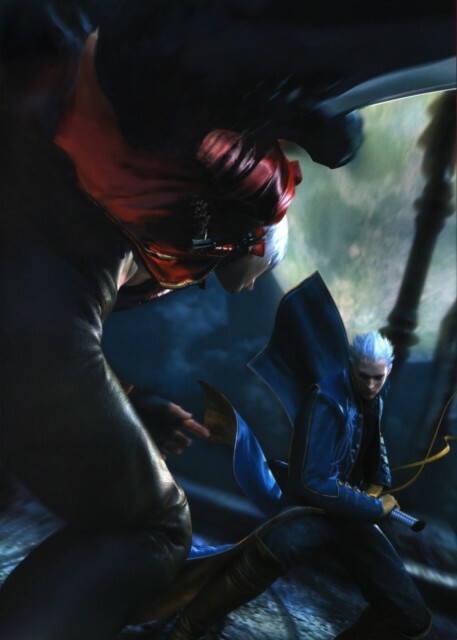 Vergil totally fangirl! *Q* Thanks! Oh man! How cool is that!? Love the pic and the deadly motion of it! Thanks for sharing! This is just awesome! Thanks a lot! This is a Very awesome image!